Mato Grosso do Sul is one of the most aesthetically beautiful states in Brazil in terms of its abundant plant and animal species and its gorgeous vistas. This makes it a popular destination amongst tourists from Brazil as well as from other countries the world over. It is surrounded by the states of Mato Grosso, Goiás, Minas Gerais, São Paulo and Paraná as well as by the South American countries of Paraguay and Bolivia. Mato Grosso do Sul maintains good relationships with these neighbouring countries, largely because of its location and the relative challenge of accessing other great centres in Brazil that it experiences. Therefore, some of its culture, customs and peoples reflect those of such neighbours, integrating these nations with one another to a certain, yet significant, extent. 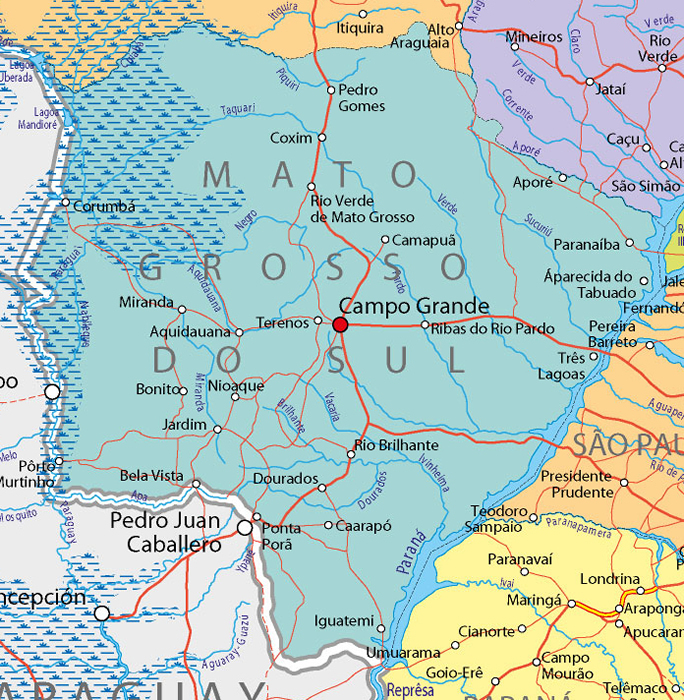 Mato Grosso do Sul was, originally, part of the larger state of Mato Grosso. Therefore, its name means “thick forest of the South”, while Mato Grosso is situated in the North. Mato Grosso had become very large, and was split in 1977. It was granted state status in January of 1979. Mato Grosso do Sul is hot and humid and its boasts subtropical and tropical climates. Even the cooler winter months are sunny, with daytime highs of about 24 degrees Celsius. The distinct rainy season extends from October to March of every year. With these ample rains, the marshes fill with water, creating a complex system of waterways on which boats provide the main source of transport. Gallery forests and stream valleys cut through vast savannahs in this country, creating a spectacle of natural wonder. There are a large number of grottos and caves, which have been protected from the harmful effects of human habitation to an enormous degree, ensuring that their splendour is authentic and breath-taking in its simplicity. One of the major obstacles to the industrial sector in Mato Grosso do Sul is the distinct lack of power, which is a necessary resource for almost every form of business. While the service sector maintains dominance in its contribution to the region’s GDP (Gross Domestic Product), it is closely followed by agriculture. Soybeans, pork and chicken are very important products of the region and are also major exports. In addition, wheat and cotton are vital crops.